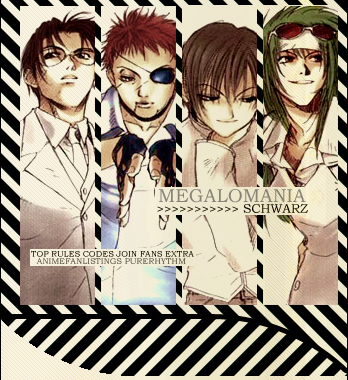 Megalomania is the fanlisting for the character group Schwarz in the anime/manga Weiß Kreuz. If you're a fan of this motley crew of psychopaths, feel free to join! Layout created in Photoshop 7 and notepad, using Katze's personal scans and textures from Colorfilter. Layout tested in Mozilla Firefox 2, IE 7 and Safari. Megalomania was last updated on 10th March 2019 and currently has 10 approved members from 6 countries. There are 0 pending, and please welcome our newest member(s) Levi! This fanlisting is happily powered by Enthusiast. To view the most recent non-member updates, please visit the updates page. If you own a related fanlisting and would like to affiliate, please email me via the contact form.